Since its inception, the Tuesday Morning Breakfast Forum has raised money for charitable purposes. Participants have passed the hat for students in need. The Forum has directed excess funds from its coffee fund to support of the Park & Recreation centers where it met. In keeping with all Forum activity, its charitable work has been informal. In 2016, co-founder Sarah Stevenson approved the creation of this MJ Entrepreneurial Action Fund. The fund honors the life work, entrepreneurial spirits and community contributions of two longtime Forum participants: Laura McClettie, and Maurice Jones. The fund essentially began with a $20 bill from Maurice Jones. Action! Stevenson directed that excess funds in the Vernon M. Herron Coffee Fund be moved to the MJ Entrepreneurial Action Fund at the end of each month, beginning with April 2016. Carlene Switzer-Greene with gifts and gift cards on Dec. 20, 2018. The Fund accumulated $257.27 through Nov. 30 entirely from the Coffee Pot Fund. 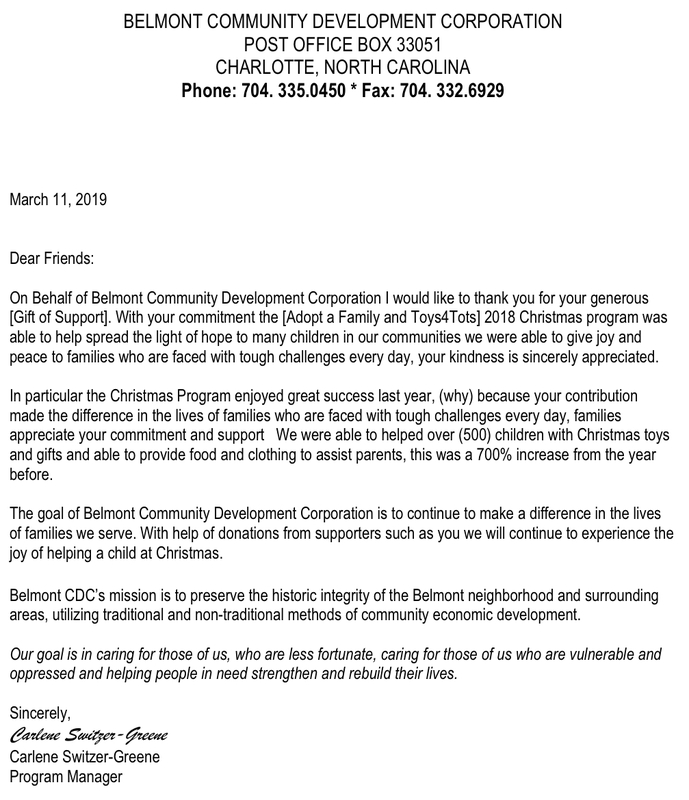 At The Dec. 18 Christmas Party, facilitator Mary Johnson announced that the the Forum would donate to the Belmont Community Development Corporation. 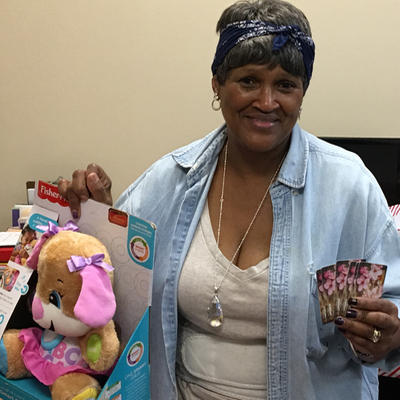 On Thursday, the day before the Belmont CDC Christmas Party at 3 p.m. at the Belmont Center, Carlene Switzer-Greene, right, received ten $25 Walmart gift cards, which she said she would pass on to the grandmothers in the neighborhood who are helping raise young children. Greene was expecting 150 children for the Dec. 21 party. The remaining $7.27 will get the Forum a start on collecting funds in 2019. The video below was shown at the Forum on March 12, 2019. To start it, click on it. The Fund accumulated $278.92, through Nov. 30, entirely from the Coffee Pot Fund. 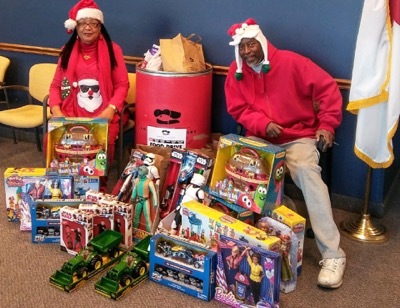 Mrs. Stevenson directed the funds be used to purchase toys for Toys for Tots. At right, Santa’s helpers Natheley McElrath and Ben Felton are shown Nov. 11 with their purchases at the Red Cross pickup location for Toys for Tots. The Fund’s balance was transferred to McElrath on Dec. 12. In its initial stage, the Fund will accept donations, either by name or anonymously, at the donor’s direction. Initially, the donations will not be tax-deductible because the Forum is not a nonprofit. All monies will be accounted for below. The Fund’s assets will be held by custodian Steve Johnston until other arrangements are in place. Checks payable to “TMBF/Steve Johnston” will be credited to the Fund. For the 2016-18 cycles, no such checks were received. As the terms of the Fund change, this paragraph will be updated. Below are the financials related to the Fund.